We are tagged as the one of the leading manufacturer and exporter of the different kinds of trolleys. We provide a great range of material trolley, service trolley, platform trolley, wire mesh trolley to cater various industries like automobile, food stores, electrical, mechanical and many more industries. These trolleys are used to keep and transfer different items. It is made from high grade material. 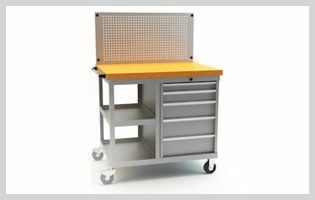 Service trolley contains 2 to 3 adjustable shelf to arrange items with different shapes and sizes. These adjustable shelves are more convenient to place more items, same time. Items of more use can be arranged on top shelf during working at standing height. Platform trolleys contains platform to place the heavy load to transfer from one place to other. It is provided with caster wheels to make easy transfer of load. The platform of the platform trolley is made of the high grade steel with reinforced with stiffeners. They are also available with guides to prevent the spill out of material or items. Wire mesh trolleys made from fine quality meshes containing higher tensile strength.